I read this back in 2015 when it came out, but since the series is at its close with War Storm coming out, I decided to finally review it! Review in a Nutshell: Red Queen is a fantastic first book in an epic dystopian/fantasy series. While some plot points may not feel the most original, the beautiful writing and fascinating characters make up for it! Red Queen takes place in a dystopian world where there are two types of people, those with red blood and those with silver. The Silvers have a variety of powers that allow them to reign over the Reds and use them as cannon fodder in an endless war. Mare Barrow is a Red, but when she tries to avoid being conscripted into the army she discovers she has her own powers, powers that she can’t possibly have. In an effort to save face, the King forces Mare into an elaborate lie that throws her world upside down, but can she keep up and survive the brutal world of the Silvers? This book is fantastic. The plot is gripping and fast. While there are definitely a few YA cliches, most dystopians inevitably include those cliches. They’re practically impossible to avoid. And I do think that as the series goes on it gets more and more original. Plus, there are plenty of positives that make this book truly unique and a must-read. For instance, Victoria Aveyards writing style. It is absolutely breathtaking. There are a thousand quotable lines in this book alone that I could go on about for days. 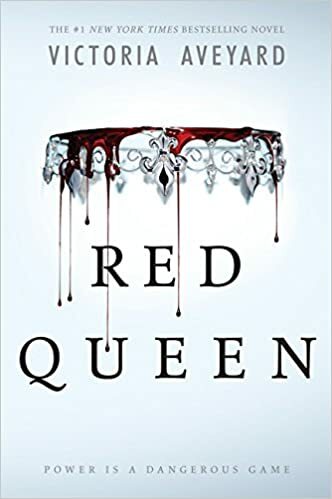 In Red Queen, the characters each breathe new life into these typical-dystopian-characters cliches. Each of them are complex and it makes this book have an unpredictable side to it. Speaking of unpredictable- the plot twists. They definitely catch you by surprise in this! You never see what is coming, and yet when those twists happen they aren’t forced or just plot-twist or plot-twists sake. Okay, time to change the subject so I don’t spoil anything. The setting. It’s extremely well-developed, from the Stilts to the Silver Court, Aveyard does a fantastic job describing the world without overloading you with too much exposition. When she describes the world it doesn’t even feel like a dystopian version of the Northeastern US, and I didn’t even connect those dots until I saw the map. Yet when I look back I can see how it was that way all along. She managed to make this area I know so well into something completely her own, yet also dropping hints of the truth. Victoria Aveyard is an amazing author and this book is proof of it. Red Queen is a breathtaking leap into a bloodthirsty future filled with betrayal, war, and magic.